The good thing about posting a recipe every weekend is that it forces me to cook. I’ve gotten rather lax about making my own meals lately. I use a lot of energy fighting my chronic headache, which hasn’t left me much strength to do normal things like cook or do the dishes or floss every night. Instead, I’ve been eating pricier instant dinners or buying wraps and salads from Whole Paycheck. But here’s a recipe that wasn’t too taxing, didn’t take too long to cook and mixed up my protein and veggies into one tasty, filling meal. Mix lemon juice and chili powder in bowl. Stir in chicken. Cover and refrigerate 15 minutes. 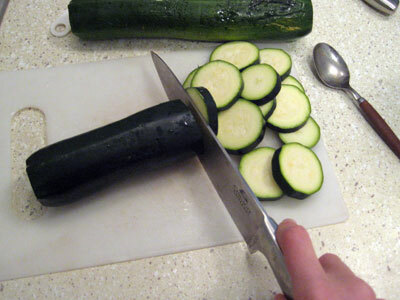 Cut zucchini and yellow squash into thin slices. Coat 12-inch skillet with 1 Tablespoon of oil and put on high heat. 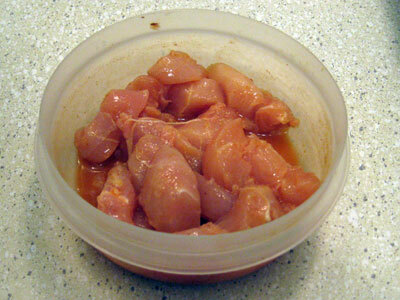 Add chicken and marinade. Stir-fry until chicken is no longer pink in the center. Remove from skillet. Add remaining 1 Tablespoon oil. 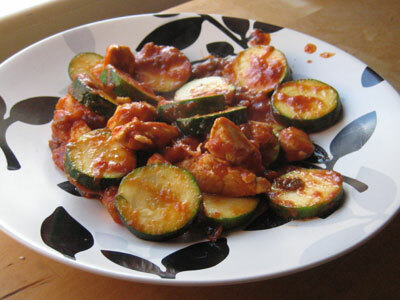 Add zucchini and yellow squash and stir-fry for about 4 minutes or until vegetables are crisp-tender. Add chicken, salsa and cilantro. Cook and stir until hot. Serve. First I chopped up some skinless chicken breasts into bite-sized pieces and stirred them into a marinade of lemon juice and taco seasoning. The recipe says to use chili powder, but I prefer the taste of these taco seasoning mixes made by Old El Paso. You’re supposed to let that sit for 15 minutes, but I never do. Me want food now! Me hungry! Next I took the zucchini out of the fresher drawer because their skin was getting wrinkly which was a sign they were getting old, just like in humans. I usually also use a yellow squash, but I didn’t have any and I DID have two zucchini, so no squash for me this time. So, yeah, so far I’ve followed the recipe by about 50%, and later on I’m not going to use cilantro either. If you’re new to cooking, it’s important to learn that this is ok. Modifying recipes for your tastes and for what you have on hand is fine and actually encouraged. I cooked the chicken until it was mostly done, which didn’t take long since the pieces were so small. Then I dumped that on a plate and cooked the zucchini. Once they looked crispy, I dumped the chicken back in and then dumped the salsa on top of that. It was like a game of musical chairs with produce and poultry. And that’s that! The southwest chicken stir-fry is ready to serve! Yum. 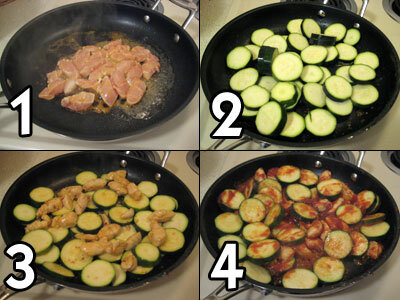 Looks like something I’d like to try, just wish my kids would eat zucchini, which I LOVE. A thought on why the taco mix might be more appealing than just chili powder- could it be my good friend sodium?? I’m thinking I could make it and take to work for lunches, yum. I know you don’t want head ache advice, but have you tried eliminating all the processed foods you eat? MSG is hidden in most everything that is packaged, it seems. Even your taco seasoning probably has some. I, too, have learned to enjoy the fun art of food substitution in cooking. I use recipes very loosely and end up with my own delicious variations (most of the time!). I find you can make recipes healthier quite easily with the right substitutions. I stick with real sugar, but a lot less, for example. I only use butter or olive oil (and very occasionally canola oil for a few baking recipes) and I never buy any of the reduced fat cheeses or other manipulated dairy foods. Rule of thumb ~ if your grandmother didn’t cook with it then you shouldn’t (or in your young case, perhaps you should think “great-grandmother!). Goodness, I’m excited to be the third commenter. Often I can’t think of anything to add to your 55 previous commenters so I retire, defeated. Whereas now… umm…. I love your comment from a couple of posts ago that you’ll miss your co-workers when they have coronaries. You have such a great sardonic sense of humour. Anyway. I enjoy your blog, like so many other people. @Linda – I eliminated packaged taco seasoning because of the MSG– now I make my own (luckily I almost always have these spices on hand) and it’s sooo much more tasty anyway! 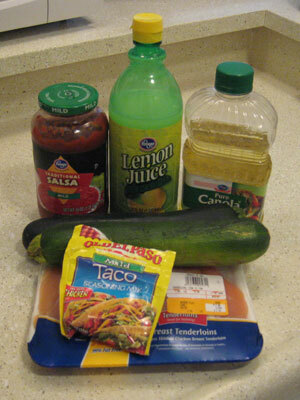 About two tablespoons of the mixture equals one packet of taco seasoning. This looks so delicious! I love cooking, but I’m terrible at it, so I need easy and yummy recipes like this. MMM. That looks really tasty. Thanks for the recipe I think I am going to give it a try. That looks absolutely fabulous! I could definitely use this great recipe in my weight loss plan. I just finished reading Gerard Musante’s newest book, “Structure House,” in which I am learning how to eat better. This recipe goes along well with his plan. Thank you so much! This looks like something I will love. Thanks for sharing. I tried this recipe tonight and it was great!!! Sounds yum. I am going to make this sometime this week. As always thank you for sharing. I love getting new ideas! I made this it was really good! I used fresh salsa (in the refrigerated section) as well as a spice mixture instead of taco powder bc taco powder I could find at the store had some weird sounding stuff in it (cornstarch, maltodextrin, SUGAR!). Thanks for a great recipe! !